Want a powerful pressure washer but one that doesn’t surpass the 3000 PSI level? Then 2700 PSI level is for you. Read the best 2700 PSI pressure washer reviews now! If you need a relatively powerful pressure washer machine, a 2700 PSI pressure washer unit is one to consider. Most 2700 PSI pressure washer reviews reveal that such powerful machines can be used both in heavy-duty residential uses and some commercial purposes. In this article, I’ll share the 4 best 2700 PSI pressure washer units that you can find in the market. I also include some useful information about the different cleaning applications that are suitable for a 2700 PSI pressure washer machine. It is hoped that after reading this article, you’ll have an informed buying decision and will have the best 2700 PSI pressure washer that suits your needs. Check Out The Table Below! 1. How Much Does A 2700 PSI Pressure Washer Cost? 2. Will I Damage My Car If I Wash It Using The 2700 PSI Pressure Washer Machine? 3. What’s The Flow Rate Of Most 2700 PSI Pressure Washers? 4. Can I Attach A Surface Cleaner To My 2700 PSI Unit? To identify the power of a pressure washer, you need to compare its cleaning unit relative to another. The general rule that most professionals consider is that the higher the cleaning unit is, the more powerful is the machine. As you may know, to get the pressure washer’s cleaning unit, you multiply its PSI level and its GPM level. However, in some instances, two pressure washers have different PSI and GPM levels, yet they have the same cleaning unit. In this case, you have to remember that the pressure washer with the higher PSI level is best for rotary nozzles as it can enhance the nozzle’s rotation; thus cleans efficiently. The one with a higher flow rate or GPM level, on the other hand, works best with flat tip nozzles as it can bring more volume of water per minute; thus rinses a surface more effectively. To know how a 2700 PSI level pressure washer fair with the other PSI level units, please refer to the table below. If there are pressure washer brands that I trust other than Husqvarna and Karcher, Ford is surely on the list. Ford is not just a reliable brand that produces vehicles and car accessories, the company is also known to uphold its reputation in the pressure washer industry. 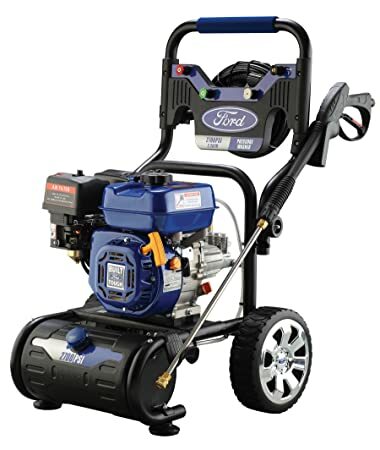 Introducing Ford's powerful 2700 PSI pressure washer! This pressure washer machine is both high pressure and high flow rate. With 2700 PSI level and 2.3 GPM flow rate, you can expect a total of 6,210 CU cleaning power. The Ford FPWG2700H-J Gas 2700 PSI Pressure Washer is equipped with state-of-the-art technologies, including its 180cc OHV engine and a three piston axial cam pump. As if these impressive engine and pump are not enough, Ford FPWG2700H-J Gas 2700 PSI Pressure Washer is also being offered at a very reasonable price. With its quality engine, pump, and high cleaning power, this pressure washer can tackle tough jobs and stubborn stains in no time. To avoid back pains and muscle fatigue, its spray gun features an ergonomic design. It also include 4 quick-connect removable nozzle tips: zero, fifteen, forty, and the standard soap nozzle. Mobility issue is also not a problem with Ford FPWG2700H-J Gas 2700 PSI Pressure Washer as it has 12-inches wheels that never go flat. The handle's grip is also covered with cushioned to make it comfortable to use. About safety, this 2700 PSI pressure washer is proven and tested by several organizations as safe to use. Ford also offers 2-year limited warranty service for this unit. It’s an affordable pressure washer machine. This machine has a powder-coated frame and can last longer than most 2700 PSI pressure washers in the market. This is a heavy and bulky unit. Some connectors are made of plastic. Warranty service doesn’t include commercial use. I haven't really heard much about Black Max before, so it wasn't on my previous best pressure washer list. 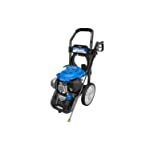 But on my quest to find the best pressure washer machine, I stumble on this great pressure washer brand in several 2700 PSI pressure washer reviews I've read. I have also watched videos on YouTube about how this particular pressure washer unit works. Black Max 2700 PSI Gas Pressure Washer is categorized by many as a residential gas pressure washer. This is because most of the cleaning tasks it can handle are house cleaning tasks. However, don't discriminate this unit just yet. I find out that Black Max 2700 PSI Gas Pressure Washer is also a great pressure washer for certain commercial tasks. One 2700 PSI pressure washer review wrote that you can use this machine around shop like a car washing business. Isn't that great? It's a great pressure washer for driveways, decks, and cleaning the exterior of your house. Black Max 2700 PSI Gas Pressure Washer is powered by Subaru 174cc engine. If you haven't known yet, Subaru is a popular car brand known for its high-performing engines. This is a 4-stroke pressure washer, so it doesn't require mixing gas and oil to start working. Five extra quick-connect nozzle tips come with this package. Each nozzle is suitable for different surface cleaning. Unlike other gas pressure washer machines out there, this one has a simple design and is much lighter. Doesn’t have a power start. Not recommended for car washing. If you search Quipall 2700GPW 2700 PSI Gas Pressure Washer online, you'll know how many great reviews this pressure washer unit receives. People are not only happy with its impressive performance but as well as its versatility. 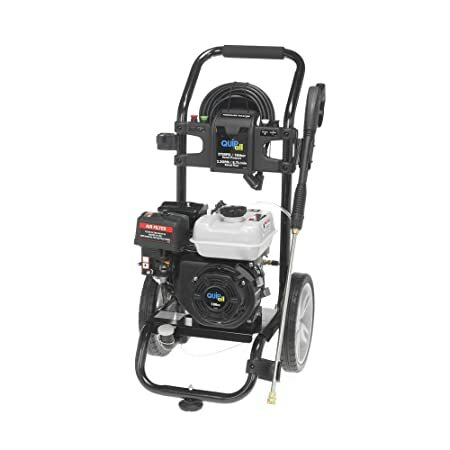 You can use this 2700 PSI pressure washer unit in various cleaning applications, including, but not limited to, cleaning patios, decks, walkways, RVs, and other tough cleaning tasks at home. 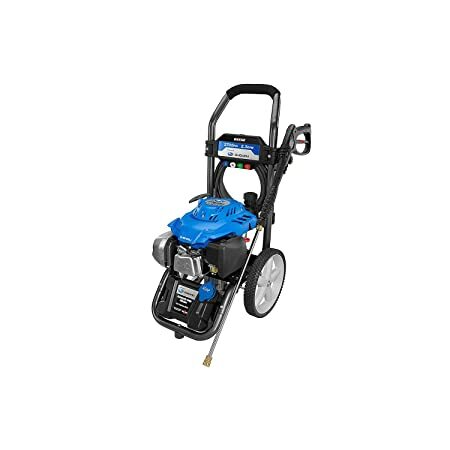 In terms of engine, this pressure washer unit boasts an engine with a power of 180cc. And when it's time to start the machine, you can do so easily with its standard recoil system. This brand may not be as popular like the others, but Quipall 2700GPW 2700 PSI Gas Pressure Washer surely is one great unit to look forward to. I always consider other users' review when doing my own, and Quipall 2700GPW has many good reviews so far. A lot of its users commend how easy it is to assemble the unit. It's a high-quality and efficient pressure washer unit with powerful engine. This is priced reasonably, so it doesn’t hurt your budget that much. Quipall 2700GPW 2700 PSI Gas Pressure Washer is also lighter and easy to move as compared to other gas pressure washer machines. It has a great compressor, so it can also be used as an air compressor pressure washer. Four quick-connect nozzles are included when you purchase this machine. The nozzles are zero, twenty-five, forty, and soap nozzle. With integrated handle that makes it easy for you to move the unit from one place to another. Buying replacement parts for this unit is easy as Quipall also sells parts and accessories. Has built-in detergent tank for when you use the soap nozzle. The gas cap gets easily damaged though. So, make sure not to twist the cap too much and get it broken. Some parts, like the tube to its handle, bend easily. Karcher has always been one of my go-to brands when looking for the best pressure washers. If you may have noticed in my other reviews, some of my top picks are from Karcher. Up to this date, Karcher hasn't failed to impress me with their top-notch products. 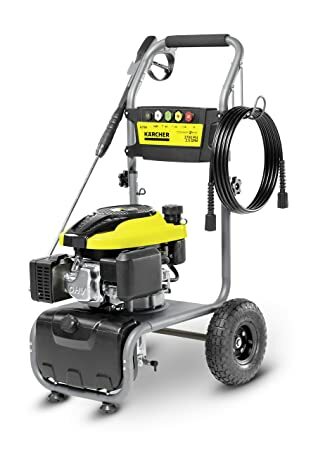 So, if you're going to ask me which 2700 PSI pressure washer on the list is my most recommended unit, then I'd say Karcher G2700 gas pressure washer, of course! Let me tell you why I am impressed with this pressure washer unit. Firstly, this has the highest cleaning units among all the four pressure washer machines on the list. As I mentioned earlier, the higher the cleaning unit is, the more cleaning applications the unit can perform and the more powerful is the pressure washer. With 2700 PSI and 2.5 GPM rate, this machine gives you a total of 6,750 CUs. Now, you would initially expect a high caliber pressure washer like this one to be heavy and bulky, but not Karcher G2700. It's relatively lighter than most gas 2700 PSI pressure washers. It also has a slim upright design, which makes unit storage a lot easier. This high-pressure machine cleans quickly and efficiently. Among all the pressure washers on this list, Karcher G2700 has the most powerful engine with Karcher KPS 196cc engine. Its pump is an axial cam pump but with an aluminum head, making it lasts longer. Equipped with pneumatic tires that provide great traction, especially when the unit is used on rough terrains. Aside from its upright design, its folding handle also contributes to its compact storage. Comes with five nozzle attachments, namely: zero, fifteen, twenty-five, forty, and detergent or soap nozzle. Karcher G2700 is also a child-friendly machine since its spray wand has a child safety lock. This is backed by a two-year pump warranty and another three years warranty for the engine. Its welded steel frame also protects the engine when impact is encountered during operation. Provides great power and performance when cleaning oil and grease. Looking for replacement parts and accessories for this machine is a bit difficult as it is only compatible with Karcher accessories and replacement parts. There is a tendency that the bolts are not tightly snapped, so check before operation to avoid accidents. It’s quite hard to give an exact price to a machine as price usually varies by brand and the PSI and GPM level of the unit. However, most 2700 PSI pressure washers have a starting price of $250 and can go as high as $800. Some commercial-grade units with advanced technologies and features are being offered at $1000 or more. If you’re on a tight budget, don’t get disheartened as you can still buy a good 2700 PSI pressure washer at a bargain price. You may have read some pressure washer reviews saying it’s not recommended to use a high-pressure machine when cleaning cars. Most suggestions are to use low-pressure when doing car washing. But the things is that it depends on which part of the car you want to clean. Of course, when cleaning the car windows and painted parts, you should use the low-pressure nozzles such as the forty-degree and soap nozzle. Though the pressure can also be adjusted through attaching a nozzle tip. Hence, using 2700 PSI pressure washer to wash your car will not necessarily damage it. Just make sure you avoid the windows and headlights. Also, make sure to use the right nozzle attachment. Most 2700 PSI pressure washer reviews reveal that pressure washers with high PSI level are commonly coupled with high flow rate. PSI level starting at 2500 PSI to 3000 PSI have a flow rate level of not less than 2.3 GPM. 2700 PSI pressure washers with low flow rate will have low cleaning units, thus they are not powerful enough to handle tough cleaning jobs. You might as well buy a light-duty pressure washer instead. So, always check both the PSI and GPM levels. Most 2700 PSI pressure washers allow a surface cleaner attachment. This is because the 2700 PSI level is suitable for patios, decks, and driveway cleaning, and these tasks usually require a surface cleaner to complete the task quickly. Therefore, most 2700 PSI pressure washer manufacturers make sure to allow surface cleaner attachment in their units. What’s my most recommended 2700 PSI pressure washer on the list? Considering the engine and features included, I’d say it’s none other than Karcher G2700 2700 PSI Gas Pressure Washer! I think this pressure washer gives me everything I want in a 2700 PSI unit. I also trust the brand and know they only offer quality product. I like never-flat tires, but I prefer to have pneumatic tires for pressure washers intended for backyard and outdoor uses. This is because I find pneumatic tires to wobble less when used in an uneven terrain. They also tend to provide more bounce and lessen the impact. But for those buyers who want an affordable 2700 PSI pressure washer, I’d recommend the Ford FPWG2700H-J Gas 2700 PSI Pressure Washer. The unit is affordable but is still packed with great pressure and performance. It’s a good deal. Choosing the best 2700 PSI pressure washer machine that suits your needs is like an investment. Knowing you get the best product with excellent technologies will compensate if the price is a bit expensive. However, buying a low quality pressure washer because it is cheaper is not and will not be a good buying decision. When caught between choosing quality vs. quantity, I always follow my guts and go with quality. How about you? Do you check the price first before the features when shopping for a pressure washer? Share your experience and thoughts below.